A significant theorist in the early childhood education field is Urie Bronfenbrenner who, in 1979, proposed his “ecological systems theory,” sometimes referred to as the “ecological framework for human development.” This theory offers a multidimensional systems model for understanding the influence of family through to economic and political structures; thus, it presents a way of understanding the human life course from early childhood through to adulthood. In this theory, the ecological framework enables the mapping of information about individuals and their contexts over time in order to understand their diverse systemic interconnections. A critique of this model, however, from a childhoodnature stance, is that it ignores consideration of human-nature interconnections. Thus, it is a deeply anthropocentric model of human development that is at odds with emergent post-humanist thinking that seeks to de-center the human condition. In this chapter, we argue that the pervasiveness of this human-centered systems approach works against sustainability, in that it reinforces the sociocultural, political, and economic dimensions of being human at the expense of environmental interconnections. 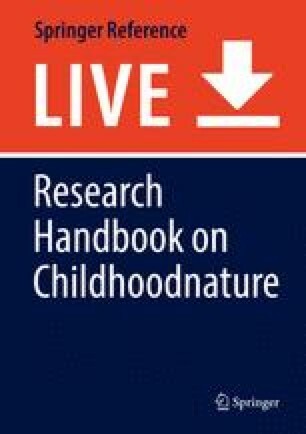 Drawing on systems theory, post-humanist theory, new materialism, a critical lens to pedagogy, and new sociology of childhood, we propose alternative ways of approaching Bronfenbrenner’s work that, both, facilitates human connections and strengthens children and nature connections that have implications for early childhood education philosophy and pedagogy. APA. (2004). Early intervention can improve low-income children’s cognitive skills and academic achievement. Retrieved from http://www.apa.org/research/action/early.aspx. Ballam, N. (2013). Defying the odds: Gifted and talented young people from low socioeconomic backgrounds. PhD thesis http://researchcommons.waikato.ac.nz/bitstream/handle/10289/8424/thesis.pdf?sequence=3. Department of National Planning and Monitoring (DNPM). (2010). 2010 PAPUA NEW GUINEA – Millennium Development Goals Second National Progress Comprehensive Report for Papua New Guinea. Retrieved from http://www.pg.undp.org/content/dam/papua_new_guinea/docs/MDG/UNDP_PG_MD G%20Comprehensive%20Report%202010.pdf. Krishan, V. (2010). Early child development: A conceptual model. Early Child development Mapping Project (ECMap), Community University Partnership (CUP), Faculty of Extension, University of Alberta, Edmonton, Alberta. Retrieved from http://www.cup.ualberta.ca/wp-content/uploads/2013/04/ConceptualModelCUPwebsite_10April13.pdf. Office of HeadStart. (n.d.). Retrieved from https://www.acf.hhs.gov/ohs/about. UNESCO. (2010). Four dimensions of sustainable development. Retrieved from www.unesco.org/education/tlsf/mods/theme_a/popups/mod04t01s03.html. UNICEF. (1989). United Nations convention on the rights of the child. Retrieved from http://www2.ohchr.org/english/law/crc.htm. Weckowicz, T. E. (2000). Ludwig von Bertalanffy (1901–1972): A Pioneer of general systems theory. Retrieved from http://www.richardjung.cz/bert1.pdf. WWF. (2016). Living plant report. Retrieved from http://awsssets.panda.org/downloads/lpr_living_planet_report_2016.pdf.